The Akai Professional AMX is the first super-portable mixing controller for the Serato platform. Given its two-channel layout and the integrated audio interface, comparisons to its Traktor counterpart – the Native Instruments Z1 – seemingly can’t be avoided. However, that comparison is unfair to begin with, because the AMX isn’t just a controller for internal mixing. 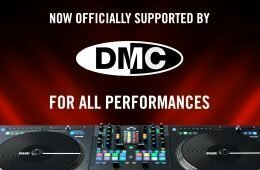 It can be upgraded on the software side to serve as a fully-fledged mixer with DVS functionality – as long as it’s connected to Serato DJ. There really isn’t much to be said about the main mixer part of the AMX. It’s your standard 2-channel layout with gain controls, a 3-band EQ, 2-way filters and level indicator LEDs per channel. It does have a mini inno crossfader though, which makes it scratch-capable. Even on the tightest setting, I’ve found the cut-in to be a little larger than I’m used to – but this is a very individual thing, and it’s easy to get a little sloppy when you’re used to Rane standards. You’ll definitely have to try it yourself – at BPM, we’ve seen DJ Rasp rock it quite comfortably, so it may very well just be me. The crossfader is reversible by the flick of a switch, which is great for people like me who have a fader hand and a record hand as opposed to full-on ambidextrous tablists. The crossfader also can be bypassed in the settings if you prefer to mix with the line faders only. Turntablists may find that the line faders have a lot of resistance – flicking them up and down with one finger while working the crossfader is hard. At this point, it’s hard for me to tell if it’s just a matter of breaking them in, but they do have adjustable curves (just like the Numark NS7 mk2 and the NV) which is nice, although unlike the crossfader curve they’re only adjustable from within the settings menu. As with the AFX, the capacitive knobs are where the fun’s at. A small “touch” button in the upper right hand corner turns the EQ knobs into instant kill switches, and touching the filter simultaneously activates loop rolls that get faster the further you move the knob from its center position. Those are also features we’ve already seen on the Numark NS7 mk2 and the NV, but it’s good to have them on something as portable as the AMX. The unit also has basic transport controls – play, cue, stutter, rewind (as in “jump to the beginning of the track”) and sync. The big push encoder at the top of the device is used to navigate the library – but with either of the “search” buttons held down, it scrolls through the corresponding deck slowly, allowing you to pinpoint specific spots accurately. This is really good for setting hot cues when used together with an AFX, which has yet to receive an update improving the search strip resolution. When a track is playing, this function also doubles as pitch bend. Speaking of pitch: in my AFX review, I mentioned that it doesn’t have pitch controls of its own (aside from pitch bend), but the AMX does. While playing with the unit, I noticed that using the AFX together with the AMX is actually the only way to effectively beatmatch manually when DJing with those units. If you use the AMX on its own, it’s going to be a royal pain because, putting it simply, the mapping makes no sense. It almost seems like they added pitch control in “pro forma”, just to be able to say “oh yeah, it’s in there”. Akai fans, put your pitchforks down and let me explain. When you beatmatch using CDs or vinyl (or a controller for that matter), you pitchbend and move the pitch fader simultaneously. On the AMX, this is impossible unless you’re a mutant cyborg octopus – because both pitch and pitch bend are combo functions that each require a different button to be held down. So in order to adjust the pitch fader, you have to hold down the tiny shift button and turn the corresponding gain knob (by the way – I’ve seen better ideas than a double mapping on a gain knob, just saying), but you also have to hold down the search button and use the big push encoder to pitch bend. Of course, if you have an AFX, you can use its touch strip to pitch bend, but you still need to do acrobatics with the other hand that controls pitch on the AMX. Arguably, you could also “pitch ride” to beatmatch (pitch bend by moving the pitch up and down around the target value) – but pitch riding requires some kind of visual reference, and since the pitch control on the AMX is an endless rotary encoder, that’s just not going to work very well. The tiny graphical representation of a pitch fader in Serato DJ isn’t really helpful either. To be fair, the Native Instrument S8 has a rotary pitch control too – perhaps beatmatching really is a thing of the past? 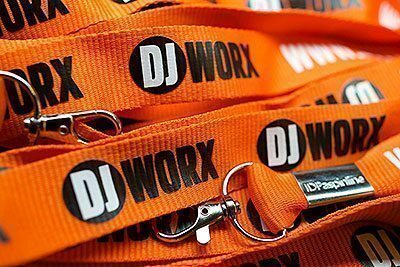 I certainly wouldn’t consider that the most important of all DJ skills – it matters what you play and when you play it. In Akai’s defense, most people that would use the AMX will probably either DJ with something that has pitch controls on board or just hit SYNC anyway, but if your grids aren’t spot-on… well, you’re not going to have much fun here. This is particularly annoying because the shift button is not only very small, it’s also not backlit and located in a very impractical spot right between the SYNC and track load buttons. Good luck hitting that in a dark booth. And no – you can’t use either of the AFX‘s two big shift buttons, because these only affect the unit they’re part of. But you can’t blame Akai for that either – this is mostly due to the way Serato works internally. Still, I really don’t understand why the shift button couldn’t have been the same as on the AFX. There would’ve been room, the positioning is unlucky anyway – might as well go for something that’s easier to hit and hold down. Let me photoshop that real quick using Akai’s own press shots for the sake of accurate proportions: left = original, right = my version. Of course, changes like that are impossible after a product has been released, so here’s an idea: the gain knobs and the push encoder have no touch-related mapping – how about using the touch button to lock the gain knobs in pitch mode and the big encoder in pitch bend / search mode? Sounds both feasible and logical – and you won’t need an additional unit just to beatmatch comfortably. The AMX has two RCA stereo ins (phono and line) and one RCA stereo out. Nothing much to say here, you can’t really expect balanced XLR or 6.3mm outs on a unit this compact. Also, in most cases you’ll be sending the master out into a club mixer anyway. Seeing as the AMX’s internal audio interface boasts pretty impressive specs (24bit / 96kHz), honestly, I would worry more about a club’s old workhorse mixer degrading the sound quality than this unit. The headphone out is a 3.5mm jack – not a show stopper as this size is default for most headphones. Just detach the adapter and you’re good to go. 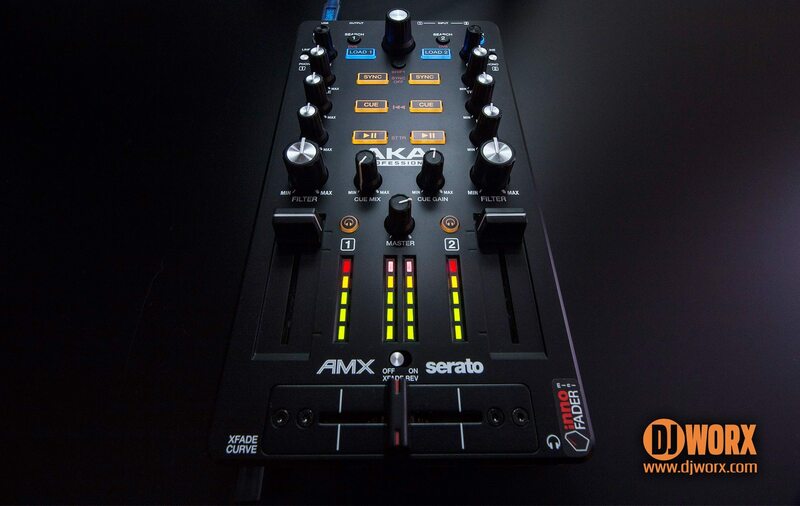 The AMX doesn’t come with Serato’s DVS pack – you have to buy it separately if you want to use the unit with a timecode source. This makes sense because the actual unit is cheaper for the end user, and not everyone wants to work with timecode – especially since together with the AFX, the AMX is a feature-rich portable solution for DJing. However, if you buy the DVS expansion pack, you’ll also be able to use any other audio interface capable of handling timecode inputs – so it’s generally not a bad idea to go for it. With the DVS pack activated, you can use timecode vinyl as well as CDs. As mentioned before, the inputs can handle phono and line levels – and it all works flawlessly. With the shift button held down, the “search” button toggles between internal playback and whatever other mode was last selected in Serato DJ – this can be absolute or relative mode for timecode control, but also thru mode (their spelling, not mine) for when you, for example, want to play something off a regular record or CD. Sadly, you can’t choose that mode from the AMX or the AFX. At least the AFX lets you choose between absolute, relative and internal modes – but not thru. In real life terms, this means that DJs who spin with timecode will always have to reach for the laptop when they want to play a regular record or audio CD. I’m pretty sure this can be fixed with a mapping change as well. The AMX supports post-fader effect return – that means that you will, for example, hear a delay or reverb tail even after you’ve faded out the effected track. This is pretty cool and works with external inputs as well – so you could even play something off a CD and still apply Serato effects to it. I honestly didn’t expect that – really cool. Like every piece of gear, the AMX is not perfect, but I’m sure both the unlucky approach to beatmatching and the way external audio sources are handled can both be fixed in a future update. Maybe there’s a way to implement Slip Mode as well? Neither the AMX nor the AFX have that option. Something I’d also like to see is a way to tweak filter resonance – just like on the Numark NS7 mk2 and the NV, the filter is pretty aggressive. 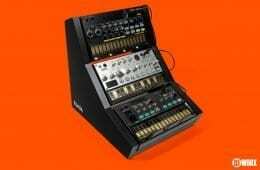 A carrying case to lift the unit up to turntable height would also be a great addition – but as with the AFX, Akai tells me it’s definitely coming. Still, I can’t help but wonder if Electrix really is the only company that ever got this right with the Tweaker (which comes with both a sturdy carrying case and four incredibly stable screw-in legs at no extra cost). Oh well. In the meantime, Magma’s control cases (I’m using the one for the Push) or anything of similar size should do the trick. If you’re looking for a portable Serato mixing interface, DVS or not – despite its minor shortcomings, I can definitely recommend the AMX. We’ve just received three shots of the upcoming official carrying cases. No word on the price yet, but it’s probably safe to assume they’re not going to break the bank. It seems the cover has holes to fit the small rubber legs which will help keep the controllers in place – looks promising.